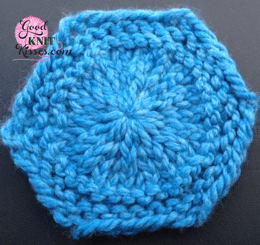 A versatile knit round; be inspired and build your own project with a granny round! •Knitting Loom (circle or any shape able to be knit “in the round”)- Large & half gauge round looms tested; 36 peg & 24 peg looms from Knifty Knitter used in samples. Main pattern written for 36 peg loom (Alternates for 24 peg loom in parenthesis). •Yarn – 1 strand of Super Bulky #6 yarn or 3 strands held as one in worsted weight. 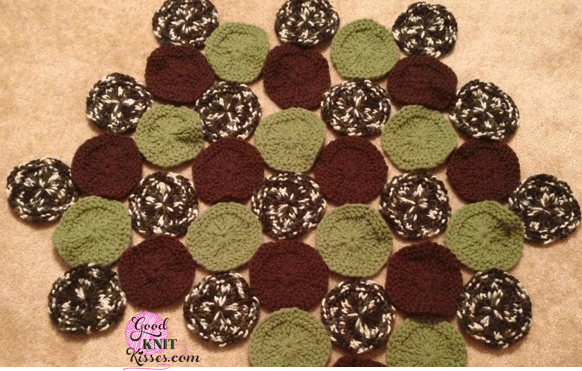 Great Stash-buster as 1 ball or skein will yield several rounds or hexagons. •Not important for this project, size of granny round will vary depending on yarn used even on all super bulky yarns from style to style; Keep this in mind when creating afghans with multiple colors. 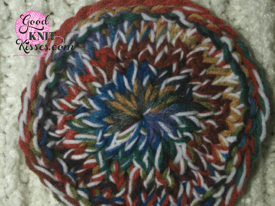 MAKES 1 Solid Circle 6 ½” wide in 3 strands #4 Medium Worsted or a 6-8” wide in 1 strand of Super Bulky depending on the Yarn company & yarn selection. 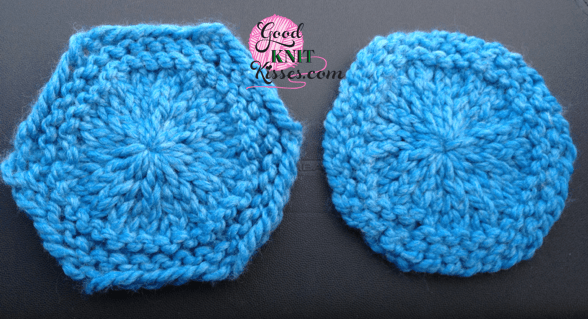 Stitch circles together for a funky blanket, use as a base to a bag/purse/bottle holder, large coaster for large mugs or small potholder. 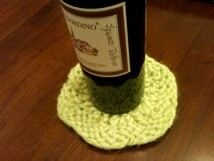 Make small ones for a scarf. Many uses! Alternate for Hexagon shape included. 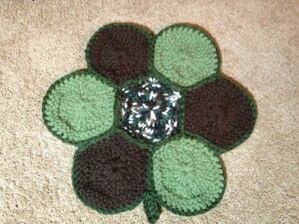 Hexagon easier to stitch together for afghan. May require extra stitch markers. *Follow along with the entire Loom Along Video for Granny Round on 36 peg loom at http://www.youtube.com/watch?v=-YAuWRbHL_s Make a smaller granny round on a 24 peg loom. 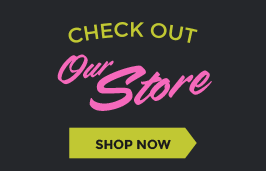 check out our loom along playlist at the end of this article for the video. SPECIAL NOTE: Keep your stitches loose the last row before decreasing if you are normally tight. When wrapping before decrease be loose with your stitches especially if using more than one strand, as it can become to tight to pick off the peg and move. Cast on 36 (24) stitches in the round, using the double EW method or cable cast on. Work your circle in a clockwise direction. Your cast on row is round 1 or row 1. Cast on 36 (24) stitches in the round, using the double EW method. Place slip knot on starter peg, if available. Wrap peg 1 twice in EW & KO. When you come to every 6th (4th) peg wrap peg once. 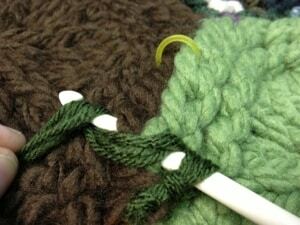 Now place the working strand under the wrap and purl the stitch. You have just purl casted-on. Purl cast on only every 6th (4th) stitch. HINT: The purl stitch is used to find the corners of the hexagon when stitching together for afghan. Thread a scrap yarn through the back of the purl cast on stitches to find them easier when connecting later. 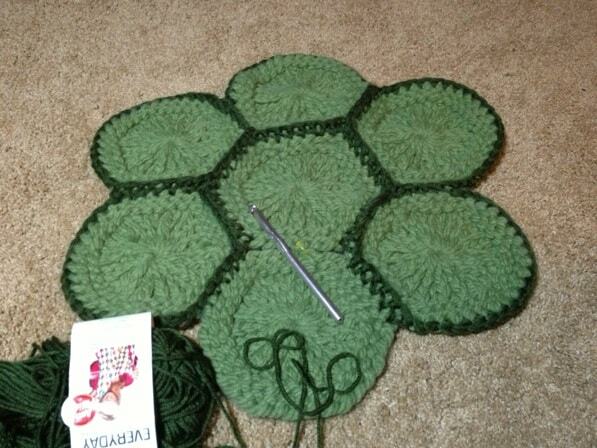 Work your hexagon in a clockwise direction. Your cast on row is round 1 or row 1. 1.We are going to divide our loom visually into 6 sections with 6 pegs in each section for a 36 peg loom (4 sections of 6 for a 24 peg loom). HINT: Use a stitch marker to mark the first peg in the section AND/OR using painters tape & a pen to write each peg number of each section. a.In round 1 of this section we will move the 2nd peg loop over to the 1st peg. Do not KO at this time. Move to the next section and do this again. Repeat 5 more times. Wrap all remaining pegs again & KO. This completes hat Row 6. You should have 30 (20) pegs remaining. b.Now take peg 4 over to peg 3 and wait to KO. Repeat for all sections. Wrap all remaining pegs & KO. This complete Row 7. You should have 24 (16) pegs remaining. c.Now take peg 6 over to peg 5 and wait to KO. Repeat for all sections. Wrap all remaining pegs & KO. This complete Row 8. You should have 18 (12) pegs remaining. 4. 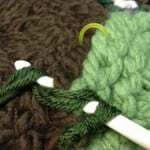 Drawstring Bind off method. Wrap the loom 1-2 times all the way around with the working strand and cut.